I don’t get hungry for liver of any kind very often, but when I do, I like chicken liver the best. You can use baby beef liver if you prefer and you can use bacon or not. I have made it all ways. I don’t usually make the gravy with it, but I have given you directions for gravy if you want to make it. Preheat oven to 200 degrees. Fry bacon and drain, reserving bacon grease. Keep bacon warm in oven. Return 2 tablespoons grease to same skillet, and on medium-high heat, saute onions till translucent; add more bacon grease 1 tablespoon at a time, if needed. Remove onions to oven to keep warm. Return remaining bacon grease to skillet. Coat liver in flour, and sear in skillet over medium-high heat; watch carefully. As soon as liquid seeps to top of meat, turn and cook 2 minutes on other side. Remove meat to oven to keep warm only if you are making the gravy. Sprinkle remaining flour into hot skillet, and stir constantly until flour begins to brown, then add broth. Boil for 1 minute, then reduce heat and simmer 1 minute longer. 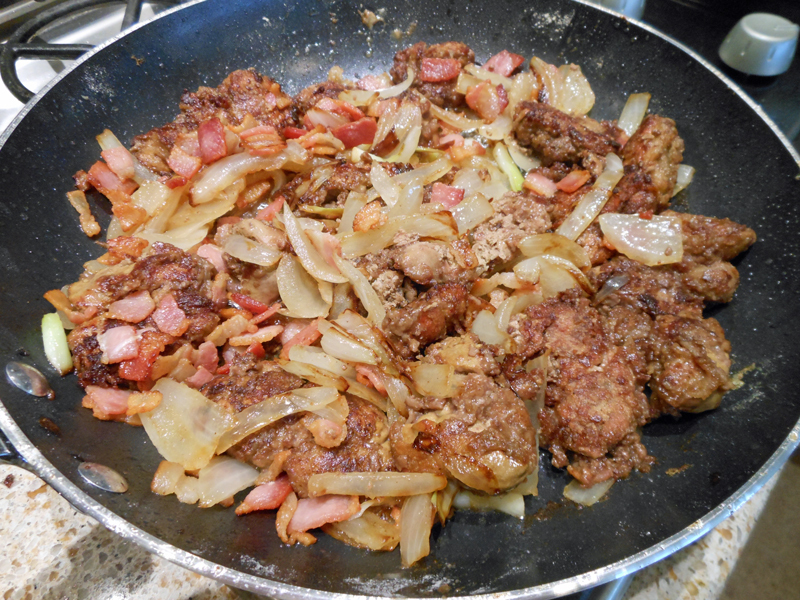 Pour gravy over liver and onions, and sprinkle crumbled bacon on top. Now, if you’re not making the gravy, when liver is done, add the onions and bacon to it and serve. You can add the crumbled bacon in it or on it, whichever you prefer.